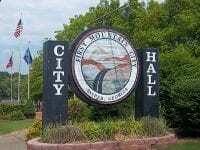 JASPER, Ga. – April’s expenses for the Jasper City Council are on the rise as they approve purchases and bids alongside an approval for over $100,000 for the Cove Road incident. These purchases came from three different departments looking to update equipment for the coming spring months. The Jasper Police Department sought approval, and received it, from the council for $33,900 for a new vehicle. According to Police Chief Greg Lovell, the need comes after several issues in the fleet including two cars in the shop for repairs and the Explorer being totaled after an accident in January. The new truck, Lovell said, will is coming from Ronnie Thompson Ford. The Water Department requested funding for rebuilding three lift station pumps in the city from Highway 108 to Piedmont Mountainside Hospital. Water Superintendent David Hall spoke to the council about the builds with three different prices. The total cost for all three comes to $32,136.28. The first pump is $7,825.04. The second needs an internal part replaced as well, making the cost $10,634.90. The third pump needs the part replaced and a bearings replaced, making the cost $13,676.34. Hall said the department already has moved other pumps in the city to cover the need that these pumps served, but this reduces the efficiency more each day. However, these pumps have served this need since 2002, according to Hall. With 17 years behind them before needing the rebuilds, Council member Tony Fountain noted that he hoped to get another 15 years out of these now. A third purchase request came from the budgeted purchase of a zero turn lawnmower for the street department as the move into spring and prepare to for the maintenance needed. City Manager Brandon Douglas told the council that the city has received bids for the lawnmower. Goss Equipment’s bid was for $11,886.20 for a Grasshopper brand. Nelson Tractor Company’s bid was $12,615 for a Kubota brand. Ag-Pro $13,649.99 for a John Deere brand. Rolling Tire’s bid was for $13,000. Mason Tractor Company’s bid was for $12,526. The council approved Goss Equipment, the low bid, for their Grasshopper brand lawnmower. Fountain clarified with Douglas about the servicing program for the equipment. Douglas confirmed that Goss said the would work and provide for the needs saying that even if they had to outsource the work, they would provide a replacement available immediately for the needs of the city. The council is also honoring a local citizen, Kyle Brock, with an official resolution to name the city dog park after him. Utility Development Planned Lonnie Waters presented the request to the council for a small marble plaque in honor of the service provided. The council quickly approved the request and pushed further to have Brock come before the council to receive the plaque so that they might further recognize the hard work and dedication he has provided to the animals of the community. JASPER, Ga. – Citizens of Jasper listened as Mayor John Weaver offered updates on proposals and plans for the Cove Road rockslide recovery. The council addressed the rockslide with information from City Manager Brandon Douglas who said the city has retained the services of Geostabilization Engineering for stabilization and repairs from the rockslide. Douglas said that the Thursday, the firm offered a proposal to stabilize and ensure safety in the area. The proposal would present a 6-day period of operations for the cost of $95,000. Douglas said they employed a third-party firm to vet the proposal. This third-party did confirm the competitiveness of the proposal according to Douglas. However, the contract came under question by City Attorney Bill Pickett who pointed out that any disputes about action or inaction in violation of the contract would require the city to go to Colorado, the home state of the company, to sue or pursue legal action against the company. Though this is an “if” situation, meaning it would only be needed if the company does not live up to the contract. However, Douglas countered saying that his understanding was that this point of the contract was open to negotiation. Another contention point came as the $95,000 is not a set price. The proposal is based on site investigations, but if additional work is needed, then additional costs would be incurred. Mayor Weaver noted that he felt much of the danger of the specific area of Cove Road was taken out by the slide. While stabilization is needed, Weaver said he felt there were much more dangerous areas nearby this site on Cove Road. Douglas said that the six-day period would allow the company to address additional nearby areas without incurring additional “mobilization costs.” This means that if Geostabilization Engineering secures the area’s safety in two or three days, the City can have them move on to the additional areas of danger on the road. Weaver went on to note that funding and taxpayers are in his consideration as he wants to go seek emergency funds from the state and federal government as well as other agencies who could help. He said he wants citizens to consider that they are working on the area to provide safety for those who are traveling on the road. He does not want to have a phone call one day of somebody being crushed by another landslide as they were driving. City Councilmember Tony Fountain said that he wants to have the city sleep at night knowing they have done everything they can. However, the city must also consider, as Weaver later said, once the city begins any work on the area, it becomes a city liability. Weaver stated that because of this liability, the city is going to take its time in the process to get each “stamp of approval” they need to ensure the safety of all who utilize the road. He went on to say it isn’t going to be a cheap and quick fix, but asked for patience as they continue along this project. The council did approve ‘up to $120,000’ in a motion from Councilmember Kirk Raffield and a second from Councilmember Anne Sneve. This motion will allow the city manager to move forward with negotiations on the proposal and finalizing details on the contract. The final vote came to 4-0 with John Foust abstaining as he said he could be part of crews working on power lines in the area. Weaver noted afterward that he is shocked that more landslides haven’t occurred with all the rain and snow and weather the city has suffered in the last year. As such, he is more worried about other dangers in the area than the recent slide that has already taken away much of that spots danger. JASPER, Ga. – Several issues have mounted up on the Jasper Fire Department in the last month. The issues are also mounting into a major budget issue for the city as they seek repair Fire Engine #2 from engine troubles and deal with an unbudgeted Fire Interface Purchase. Both of the issues come amid a new vehicle purchase for the Fire Department as well. While the Council did agree that the engine repairs could be covered as Chief Steve Roper suggested he had a few projects that he could put off until next year in order to pay for the major issue of the repair, including a driveway repair and a painting project. As the Fire Engine requires an “in-frame repair” as Roper called it, the need could cost nearly $30,000 if the engine block needs to be fully rebuilt. However, Roper also said there is a chance the issue could be a smaller issue needing a gasket replacement costing $7,500. The council approved up to $30,000 for the repairs to come from the line items of the other projects. However, this was not the biggest issue the Fire Department saw as the next item on the agenda listed a 911 Interface Purchase. Roper informed the council that the department has been in process of establishing a Computer Assisted Dispatch interface since 2018 and has seen stalls throughout last fall and winter. This system was picked up again this year with a total cost of $18,120. The interface, according to Roper, will allow all information that 911 has taken into the system and dumps the information into Ipads for users to instantly access the information, history, and conditions among other things. This not only accumulates and accesses this information, but cuts down on radio traffic and aids in reporting for the city as well. However, the $15,120 has been spent to proceed with this project, but was not budgeted in the 2019 budget. Jasper City Councilmember Anne Sneve clarified in the meeting that it was budgeted at one point but postponed. Having never returned to the budget, the City is now facing the $18,120 unbudgeted expense and seeking a way to cover the cost. While Jasper City Councilmember Tony Fountain noted that if the engine issue comes in to cost $7,500, they could could use the remaining funds to cover the $18,120 for the interface system, he also questioned what the city would do to respond if the engine took the entire $30,000. Jim Looney was present at the meeting and took responsibility for the mistake as he said his understanding was that it was budgeted, but has now discovered it was not. As the council moves forward, they are still seeking funds to cover the expense in case the engine repairs monopolized the excess funds from the canceled Fire Department projects. The Jasper City Council went into closed session in February to discuss their action on Jonah Lane from December 2019. Mayor John Weaver told citizens they were discussing a legal issue with Jonah Lane and recognized City Attorney Bill Pickett to give the City’s official stance on the rezoning. Pickett said that the Council did vote to re-zone the property to R-3 with a condition of receiving a letter from the Appalachian Regional Commission that it did not violate a grant the city had received. With no motion from the council to rescind the rezoning and no request from the property owner to rescind it, the rezoning is moving forward. This statement comes after January’s Council meeting when public comments surged against the issue and urged the council to reconsider the effects it would have on neighboring commercial developments. The rezoning in question was a C-2 lot as well. Now the rezoning sets it to residential amid other commercial developments. Citizens began protesting the issue in the meeting saying that police would undoubtedly be called as many of the neighboring commercial business owners gave examples of their businesses operating in unusual hours and causing noise that would be acceptable in commercial but considered excessive in residential zones. More complaints came in February as citizens began questioning the legality of the issue. One business owner claims he was not properly notified of the rezoning. He also claims he has proof of the failure to notify. A claim disputed by Pickett as he says the city’s department says they did notify the adjoining properties of the request. The business owner also suggested he has had difficulties receiving requested documents. These allegations, as well as others from another neighbor to the property, suggested the city would be seeing legal ramifications if they move forward with the rezoning. Mayor Weaver did voice opinions against the rezoning in December and to possible issues arising from it, but as the voting council members voted in favor of the rezoning, it is the council’s votes that direct the city’s efforts. JASPER, Ga. – The rezoning for apartments to be constructed on Jonah Lane in Jasper has stalled in this months meeting after discussion raised community pushback on the change. Leftover from the December meeting when the rezoning was first brought up and conditionally approved by the council, they now have questions and discussions coming for the future of the C-2 lot. The pitch was to rezone to R-3 for apartments. Both Brad Dilbeck and David Shouse, local developers, made note of lack of notifications for the initial rezoning requests, though Dilbeck said one of his tenants was notified. They also made comments that the Council speaks for the citizens but they don’t know or have had contact with council-members. The main argument against the apartments comes from being so close to industrial lots. Those owners said they know they will get complaints and have to deal with the police for noise complaints and complaints about late and early hours of work. With expectations of freedom to operate how they see fit, business owners said they chose their locations for its general distance from residential areas. Other complaints revolved around traffic and wear on the road in competition between the current commercial traffic and a potentially a hundred extra cars. Ultimately tabled for next month, the stall in the issue doesn’t mean the rezoning will be denied. It is still under investigation by the council who could be making a final decision next month. JASPER, Ga. – The City Council is continuing to see dissension among the ranks as a disagreement has now arisen about organizational meeting appointments. The point of debate came from the council members wanting more information and control on the decisions before coming to open meeting. Mayor John Weaver contended against the point saying that he, as mayor, makes the decisions to put before the council during meetings. All three appointments saw a motion from Tony Fountain, but no second. Each failed for that lack of a second. Pickett noted that without new appointments those serving would continue to serve until an appointment is approved. There were committee appointments for council members that were approved. Finance committee includes Tony Fountain and John Foust. Water Committee is Tony Fountain. Public Safety Committee is Dr. Sonny Proctor. Street Department in Anne Sneve. Parks is John Foust. The JYSA Liaison is John Foust. Roper-Perrow Property is Jim Looney and Sonny Proctor. These were approved unanimously by the council. JASPER, Ga. – With a review of city manager applications in November, the City Council was further updated at December’s meeting about accepted and Scheduled interviews for December 10 for candidates for the position. With four interviews set for Monday, the candidate pool is shrinking towards a final decision to hire a full time City Manager. This position is currently being filled by former council member Jim Looney. As the Council continues in executive sessions, they are to be advertised as meetings for the council to legally be in the same room for these interviews. However, the Council will immediately go into a closed executive session to perform the interviews. After the interviews, it should not be long before the council makes their decisions and formalizes the personnel hiring at an official meeting. The bonus came later in the meeting. Looney also presented this proposal after a work session discussion. A motion was made to offer a Christmas Bonus and one-time Service Award for employees. Jasper, Ga. – The Jasper City Council dealt with an option to annex into the city limits a section of property on Sharktop Ridge Road. The annexation is a part of a Planning and Zoning issue revolving around Paul King looking to have a residential development in the area connecting to Sharktop Ridge. The development would host around 23 homes, according to King. While he would utilize city water for the project, the sewage would be dealt with in septic tanks. However, King and his development project have been met with resistance on the project at the Planning and Zoning level as well as at the council meeting. While none in opposition directly opposed the project itself, several citizens spoke in opposition to the project connecting to Sharktop Ridge. Almost an hour of discussion was spent at the council’s June 4 meeting delving into the heart of the citizens’ concerns. Ultimately, the viable complaints focused on the safety of the road with increased traffic along a treacherous left turn onto the road as well as the wear and tear on the road with an extended period of heavy construction equipment traveling the road as the only access point to the development. While options were discussed such as moving the access to another point, possibly Old Burnt Mountain Road, or at least having the construction traffic access the development in an alternate route, no official action was taken. This is because the opposition to the project asked for additional study and options to prevent the “undue stress” on residents. While there is no point where the city can officially block what is allowed under a residential zoning, this issue arises as the land is being considered to be taken into the city as an R1 zone to allow the project to move forward. King mentioned and later agreed to bring in an engineer to analyze the viability of accessing the land from Old Burnt Mountain Road despite the extra costs. However, King did note that he already had the engineer glance at the area and offer a preliminary estimation that the slope and grade of the road would make accessing the land there far too costly for the project. The council will be looking at the agenda item again next month along with requested documents like the engineer’s official report and an accident report on the road and intersection with Cove Road. One citizen also requested they provide an additional independent engineer’s opinion on the access viability. He was not the only council member to comment as new member Kirk Raffield also spoke up. One of the first council members of the night to mention tabling the issue to further investigate, Raffield questioned King on his willingness to access a different road. While King suggested an increased cost would make him unwilling to go that route, he had previously agreed to look into it and said he would be willing to investigate, putting off the item until next month. With the official motion to table the annexation of the property in an effort to look for better information, citizens are already considering returning July 2 to see the further information provided and continue the discussion there.